The latin translates "if the day had been completed" from from his writings in Dialogus de oratoribus. "Dialogus de Oratoribus" or "Dialogue of the Ambassadors/Orators". The quote itself means "If the day were done." Reformation. That's all I have. third line says :calmly; refer: may of 1989 #3. This is most obviously a meeting, And if you'd like to go I advise you to decode that sheet music! I hear they make you rich if you can figure it out. Furthermore there is a time here, hopefully it has not already passed. last line loosely translates into widefield. "nisi iam dies esset exactus" --Tacitus is from a book called, "Dialogvs de Oratoribvs." Comments: Leitmotiv: a German term for a 'leading motif' which is often used to describe musical phrase that consistently denotes a certain character, setting or mood (a leitmotif). Usually the leitmotiv denotes something important in a work of art. "nisi iam dies esset exactus": This translates roughly to  "if the day were not almost spent" and appears in the closing section of Tacitus' Dialogus de oratoribus; a textbook on rhetoric. It is an unsatisfactory ending to an intellectual conversation. "Videte": This means to see, or to consult. It seems likely that it's an imperative to consult the advert from May of 1989. Number three in the advert from May of 1989 reads ""It is the nature of obsession that all things, second-best is the most detested. ": "Amor fa molt, argent fa tot." (41.23�N.,2.11�E); "
n: This is mathematical notation for "intersection". It can mean the set with members that are members of both of two other sets. �: is an ellipsis. In classical rhetoric (as known by Tacitus) it can be used in aposiopesis which is an oratory device intended to allow the imagine to fill in the details. Breitenfeld: This is village near Leipzig in Germany. BB: There are two "Battle of Breitenfeld"s but neither occur on a date that could be represented by 5/69. Both battles were part of the 30 Year War which was fought between Protestant States and Catholic States. In some sense it was 'won' by the Protestant States. G.A. : I'm sure what this means. Perhaps "God Almighty".
! : As a mathematical symbol this mean to multiply an integer by all the preceding natural numbers. Can also mean the negation. +: It's pretty obvious that this is a mathematical symbol but I'm unsure which interpretation this could be. In Set Theory it can be the Disjoint Union of two sets. Cromwell: A Puritan which was a denomination of Protestantism which included Calvinists. #: In Set Theory the hash symbol gives cardinality. Calvin: Another major Protestant founder. *: Another mathematical symbol. Could be multiplication, could be Cartesian Pairs in Set Theory. N.B. The boarder to the advert is odd. With dots at the centre of the top, bottom and left edges. The croquet-hoop and three dots suggests mathematical intersection with three dots; can this be related to the three dots in the frame around the text? 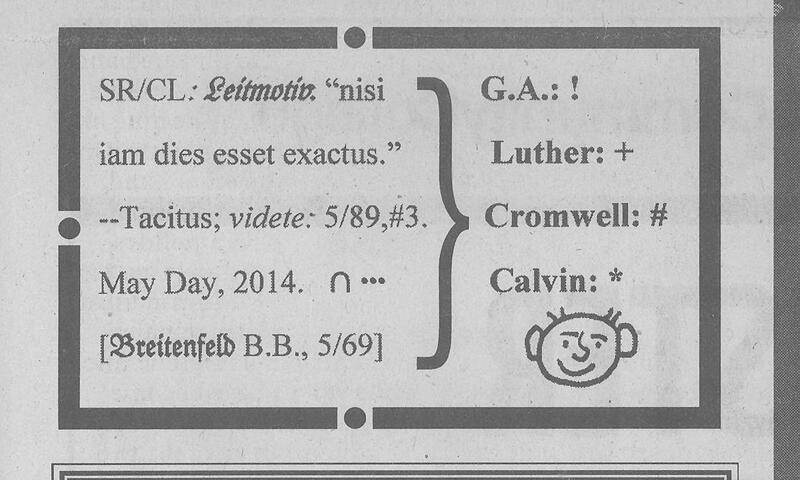 (and note most asterisk characters are six-pointed, Calvin's asterisk has five points instead). et Aprum complexus 'ego' inquit 'te poetis, Messalla autem antiquariis criminabimur.' 'at ego vos rhetoribus et scholasticis' inquit. rising at the same time and embracing Aper he said "I will accuse you before the poets, and Messalla will accuse you before the ancients. He (Aper) said "And I will accuse you before the rhetoricians and the scholars." The quote translates as "if the day were drive"
According to wikipedia, the battle of breitenfeld "ensured that the German states would not be forcibly reconverted to Roman Catholicism. ally with Sweden against the German Catholic League"
Western diplomatic sources put the toll at close to 600, with most of the victims Chinese." Meeting in the same place as may '89's #3 TITLED "The Place"
The bottom line, left side is referencing May 1969 - do you have a micro of that paper? bhance: I do not, nor do I have the ability to get microfiche access to the Daily Wildcat editions anymore - I'm not in AZ any more. (intersection) is a mathematical symbol. A (intersection) B means the set that contains all those elements that A and B have in common.